Beaded Chandelier Earrings with Blue Quartz and Glass Beads, "Brilliant Meteor"
Blazing a brilliant trail, these earrings from Nareerat in Thailand make a sparkling fashion statement. Globes of sky blue quartz are set within tiers of silver chain that suspend sparkling glass beads and additional quartz beads. Silver plated beads add their polished gleam to the effect. The earrings sway from sterling silver hooks. You can find blue quartz chandelier earrings 'Brilliant Meteor' by Nareerat in jewelry categories such as Birthstone Earrings, Quartz Earrings, Glass Bead Earrings, Brass Earrings, Silver Plated Earrings, Silver Earrings, Sterling Silver Earrings, Chandelier Earrings and Dangle Earrings. Enjoy exploring these sections for other Novica treasures. "Pretty in any color *meteor earrings*"
I have purchased two pairs of these earrings in different colors. The price is modest because of the materials, but the craftsmanship is excellent. I make jewelry and could make earrings like these, but at this price I'd rather pay someone else for all the work! These earrings are rich looking and beautiful. You will be remembered for your style for sure. 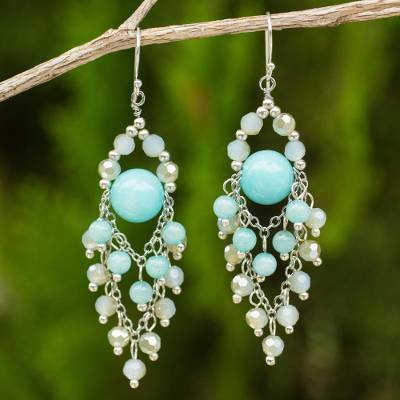 Great earrings to wear with aqua colored clothing. These earrings hang beautifully. The picture doesn't do them justice. They have a bit more sparkle. Really pretty. Beautiful earrings. Light, comfortable and much complimented on.